At least three Westerners were among the militants that perpetrated the Nairobi mall siege, Kenyan Foreign Minister Amina Mohamed said. The militants vehemently deny the claim, also adding that they are not defeated and the fighting has only just started. Reports of shooting came after the interior ministry assured the public that its forces were "in control" of the situation, after freeing all hostages. The gun shots were accompanied by an explosion and followed by security forces carrying a body out of the mall, the AP reports. What followed were contested claims about the identity of the attackers. While most believed foreigners to be among their ranks, the militants have said these people "do not know what they are talking about". Sporadic gunfire and a reported explosion heard later could be an indication that fighting is ongoing. The militants added that they spoke with their fighters, who also claim that "the fighting has just started." “Two or three Americans” and “one Brit” were among the perpetrators, Mohamed said in a Monday interview with PBS Newshour. The Americans of Somali or Arab origins were 18 to 19 years old and resided “in Minnesota and one other place.” The suspected British extremist who participated in an attack was a female who has “done this many times before,” the minister added. But the country’s interior minister, Joseph Ole Lenku, denied reports that insurgents were women. “All the terrorists are men," he said, adding that "Some of them had dressed like women." Somalia's al-Shabaab group claimed responsibility for the attack. In an interview with Al Jazeera, Kenya’s foreign minister said the group operated under direct orders from Al-Qaeda. Nonetheless, al-Shabaab's militants have claimed on their Twitter that they are changing into dead enemy uniforms, with one user speculating about the group's diversionary tactics. The Shabaab insurgents said the bloodbath was in retaliation for Kenya's military intervention in Somalia. 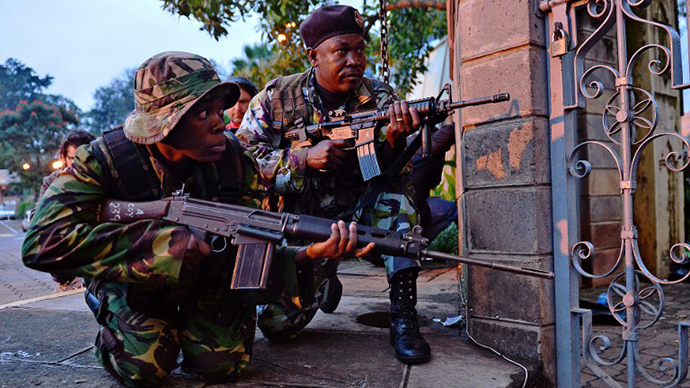 Kenya, as part of an African Union force, has sent troops to Somalia trying to stabilize the country by pushing back al-Shabaab. "If you want Kenya in peace, it will not happen as long as your boys are in our lands," rebel spokesman Ali Mohamud Rage wrote on an Islamist website, AFP reported. According to Kenya’s army chief, Julius Karangi, there were 10 to 15 attackers who were "clearly a multinational collection from all over the world." Many Western fighters, including Somalis with dual nationalities, have joined the al-Shabaab group. "They are from different countries. We have sufficient intelligence this is global terrorism," Karangi said. Kenyan police claim at least three jihadists were killed and others wounded in the rescue operation. Police claimed they have detained more than 10 people for questioning. 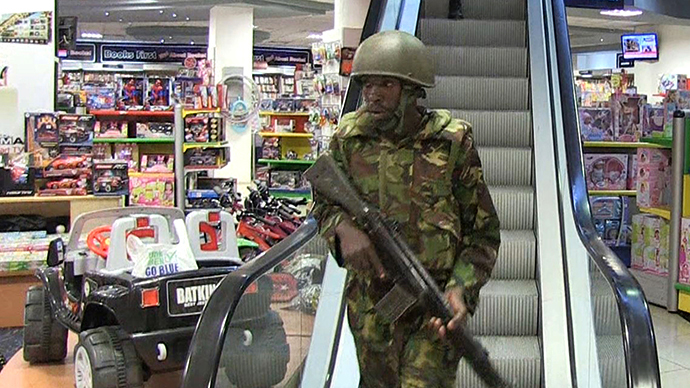 United States officials were notified through official channels that Western countries - likely including the United States - were among the armed terrorists that attacked Westgate shopping mall, US security sources told Reuters. State Department spokeswoman Jen Psaki said the department had "no definitive evidence of the nationalities or the identities" of the attackers. The White House is investigating the matter. White House Deputy National Security Adviser Ben Rhodes expressed worries that Americans could have participated in the attack. "We do monitor very carefully and have for some time been concerned about efforts by al-Shabaab to recruit Americans or US persons to come to Somalia," Rhodes told reporters. The FBI is keeping a close watch on American minority communities as Al-Qaeda is successfully recruiting American citizens to fight the jihadist cause in the US and abroad, Brian Levin, director of the Center for the Study of Hate and Extremism, told RT. “That is something that we are very concerned about and the FBI has done extensive investigation on this. I think they lack, at least in the past, the capabilities of doing so, because those people are going to be watched. But it certainly is possible, and they are certainly on the radar screen,” Levin said. Witnesses report that the attackers tried to single out non-Muslims for execution by asking them to recite the Shahada, the Pillars of Islam. So far, six Britons, a British-Australian, two French women, two Canadians including a diplomat, a Chinese woman, two Indians, a South Korean, a South African, and a Dutch woman are among at least 62 people killed in the three day hostage situation. British businessman Louis Bawa said his daughter Jennah and wife Zahira were among the dead, AFP reported. 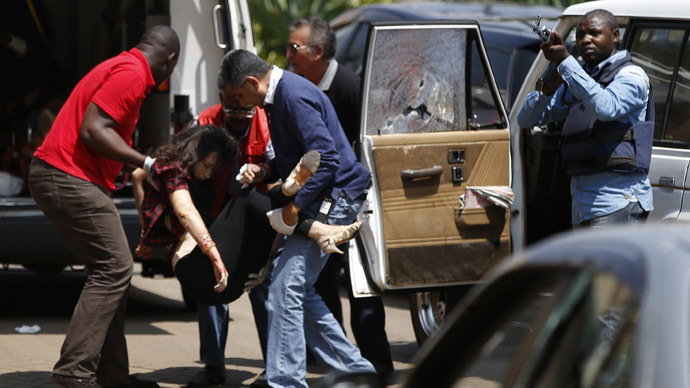 A nephew of Kenyan President Uhuru Kenyatta and his fiancée were also killed. Almost 200 people were injured in the attack, and 63 are missing according to the Red Cross. More than 1,000 people escaped the mall after the siege began on Saturday. The assault by security forces to free hostages began at dawn on Monday, with a volley of explosions and heavy fire at the scene. 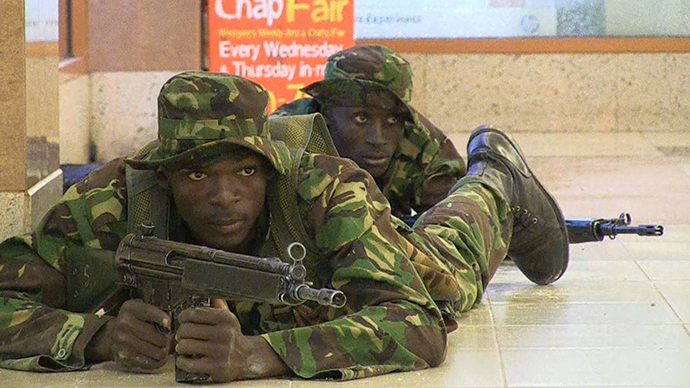 Kenya’s security forces said they have taken control of the Nairobi shopping mall and that police are doing a final sweep of shops early Tuesday morning. "Our forces are combing the mall floor by floor looking for anyone left behind. We believe all hostages have been released," the Ministry of Interior tweeted.